One thing became very clear to me as I read through the “Battle of Albridge” sequence in The Die Is Cast, the second half of the DM’s Kit adventure: the battle itself was underwhelming. Basically it came down to three encounters in a row, each run on the same map, against enemies that were depressingly similar in each case, save the last battle against the enemy general, Nazin Redthorn. I needed a way to spice these encounters up, since we had gone to all the effort of the skill challenge and lengthy email roleplaying beforehand. There was only one way to do the battle justice; the battle needed to be a mass combat of some type. I didn’t want my players fighting a simple skirmish in the greater fight, I wanted them to feel in control of the tide of battle. They were lieutenants, after all, heroes of the greatest sort, and anything less would be a disappointment to them.I looked into some systems online, and even considered purchasing a copy of the old 1E Battlesystem Rules. All the various suggestions had merits, but they were all very complicated. I needed something simple, that didn’t reinvent the wheel; stripped down, fast, and yet still epic and satisfying in scope. I decided to stay close to what my players already knew, using an extremely tweaked version of the 4E rules, modified to allow for fast turns and easy calculations but still allowing for some strategy. Here is what I sent to my players to describe the special rules for the encounter, along with the stat block for one unit. The Battle of Albridge will be played out similarly to a standard encounter. However, it’s at a bird’s eye view, with each miniature or token on the battlefield representing one of the large groups taking part in the battle. 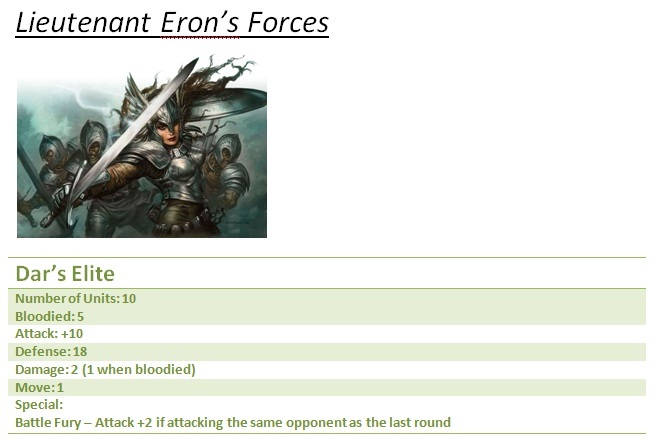 Each force has its own stats and abilities, which are very similar to your own character sheets, but streamlined. There are a few changes that I will make to regular combat for speed’s sake, as well as to better simulate the aspects of a large battle. 1. There is only one equation used: Attack Value +d20 versus Defense Value. There is no differentiation between AC, Fort, Will, etc. 2. You can move OR attack, but not both. There are no minor actions. Opportunity attacks do not exist. 3. The overall health of a force is tracked in units instead of hit points. Each member of a force represents one unit. The halfling commandos, for example, can take 10 damage in units before they are defeated. 4. When half of a force’s units are dead, that force is considered bloodied. Some forces deal less damage in combat when bloodied. Your characters are assumed to be leading your best force. They don’t count as a unit in the damage rolls and cannot be killed in this fight. They can, however, use special powers in the battle. These powers are related to either your character class or the skills you used in the “Preparing for War” skill challenge. These powers can be used by either of your forces, as your character is assumed to be mobile enough to move between them at will. Now came the tough part: I had to create ten forces for the players, and around that many for the Iron Circle as well. Most of the stats were based on level 1 creatures in the Monster Vault. Common sense adjustments here and there for balance allowed me to create forces that felt unique from one another. Special abilities were the hardest part; aside from easy stuff like elven accuracy and the halflings reroll ability, most of the powers had to be based off theme, like the Tar Devils’ ability to prevent movement. Keeping powers fair and yet still powerful was quite a tightrope act. Here’s a sample of one players’ abilities. Blessing of Bahamut – Play when your force takes damage from an attack. Prevent that damage, and your force gains +2 to attack and +1 to damage on its next turn. Barefoot Hit and Run – Halfling Commandos may both attack and move this turn. My kids helped me whip up a battle grid based on the Albridge map. There were trees and buildings to hide behind, choke points to exploit, and all in all it came together fairly well. My players were excited about the battle, looking forward to an encounter different from anything they’d done before. The battle ran smoothly, at a quick pace, and yet there was still plenty of room for tactics. Here’s a summary of what I learned from this session. Players really got into character and acted out a “war room” session with the map. They planned every move out, grouped complimentary forces together, and really enjoyed the setup. They must have spent half an hour placing units for optimum effectiveness. The special abilities made a big difference, as I had hoped. With only two powers available to use throughout the battle, the players agonized over when and where to use them. It amazed me how even a couple options added a strategic element. The entire fight took just over an hour. There was little to no downtime in between turns, unlike standard 4E combat. I decided that when three Iron Circle forces remained, they would retreat. One force fell to elven arrows as they fled, but there were still enough left to use in the rest of the adventure. The Iron Circle units were a bit too vanilla. The modified charge of the drake riders was quite good, but few of the other powers seemed to make much difference. This was in contrast to the powerful PC abilities. A bit more pizazz on my part would have made for a more compelling battle. Damage was probably too low. During the middle of the fight, it got a bit tedious after everyone had used all their abilities. Increasing damage by 1 or 2 for each force would have helped with this issue. After the mass combat, the encounter with Nazin Redthorn, the big bad evil guy, was a major letdown, and very anti-climactic. It probably took longer to set up the map and describe what was happening than it did for him to get bloodied, thanks to the mage and the thief going nova. In hindsight, I probably should have considered the characters to have used some of their dailies and healing surges during the battle, since it was described as taking several hours. This would have at least allowed Redthorn to bust a few heads before turning tail and running away to Iron Keep. The session was a success overall, even with the fizzled ending. My players enjoyed it and I had fun creating all the units and rules ahead of time. I’ve included the Word document I used for the forces below for any who are interested. Feel free to modify them and use these simple mass combat rules in your own campaign. Just let me know how it goes for you and your players! I know I’m way too late for this party but I loved the article, next week and during some months (probably half year since my group only play once a month) I will be running King of the trollhaunt warrens and I’ll use this kind of mass combat in it. The adventure is a dungeon crawl with an intermission to save the city from a troll army raid. The original adventure has 5 encounters to represent the chaos of this attack plus one really good one in a dragon article. I plan to extend this raid to a full-fledged war between a massive troll, grimlock, fomorian, goblin and troglodyte allied army and an army of the towns guard, the adventurer’s ship’s crew and every ally the heroes can summon to their help at the very start of the adventure (past patrons and character background based squads). And the war will extend over the course of a couple sessions with the mass combat rules you made being played all day and some complications the characters need to take care personally (the actual encounters in the adventure) affecting the course of the battle. Also I will introduce a third force of my campaign’s recurring villains attacking both parties to make their presence in the region known to my players. I hope the recruitment of the forces and the preparation for battle each day makes awesome roleplay encounters, and the battle itself becomes one of the most memorable moments in my campaign. I’ll know what forces my pcs ask for help next meeting so if someone wants me to make another post with stats I’ll do it. I wonder what kind of powers should I give my players, and how many, they are entering paragon afterall. I found this article quite interesting and borrowed the idea for an adventure I recently ran. The PCs were leading several units of dwarves to retake an underground complex recently lost to a swarm of orcs displaced by yet another army. I think I tried to do too much and failed at a portion of the scaling (the session was level 10). The tactical opportunities were interesting and the group spent nearly half an hour strategizing and interacting with NPCs. However it was apparent that only about half of the group was highly engaged in the strategy portion while the other half were on the fringe of the planning. The execution proved to be a bit cumbersome and lasted longer than the attention span of a couple players. To be fair, I tried to incorporate non-combatants (which one unit gleefully pursued) and moral checks for both sides (that was the mechanic that failed). I also considered another mass combat mechanic from the Grey Wulf’s Lair website (http://greywulf.net/2010/01/war-machine-revised-mass-combat-for-4e/), but the mechanic did not make sense under the circumstances. Ultimately, I think both mechanics provide a compelling opportunity for DMs. My recommendation is that the DM remains sensitive to player’s state of mind and preferences in game play, the storyline to-date, and how tweaks in the mechanics might play out (I’ll admit, I’m better with the storyline and reading the players than I am with the math). Thanks so much for this excellent post and the unit download. I’m stealing heavily from your idea and going to run it for my group this evening. I lowered the number of troops down to 150 v 150 battle. I only did minor tweaks to the damage, so I’m hoping that removing 50 troops from each side will alleviate the issue you had with the grind-fest toward the end. I added an additional mechanic of “save the wounded” as a victory condition. For every 4 units lost in a squad, I’m putting a wounded soldier token on the battlefield. This will be a villager/rebel that the heroes can save by using a healing surge and carrying the token back to the “triage” area.Their hero mini will move with their squads but will have to temporarily “leave command” to carry the wounded (if more than 5 squares from their troops, they may not use their special command powers). A large part of their victory condition is that they must save as many wounded as possible. I’m hoping they will have to agonize over “the needs of the few” with this mechanic. We’ll see how it works. I’ll post my results after it’s all done. I love it! This could be expanded indefinitely; it’s really a mini game with a nod at the D&D rules set. I hope to get a chance to use this! Although they are written specifically for v3.5, they could be used in 4.0 without many changes. I would appreceate any comments.